When app store was in its infancy, businesses myopically focused on getting more and more downloads. The very success of an app was equated by the number of downloads. Fast forward today, most businesses realise that acquiring users is not a challenge, retaining users is. You might have managed to land on your audience’s smartphone screen, but what if it never takes-off from there? Both flappy bird and angry birds bagged millions of downloads in one day but while the former couldn’t retain its users, the latter did and that’s what made it one of the top grossing apps of all time. The bottomline is that user retention is the holy grail of app marketing. Some of you might be thinking, what in the world it has to do anything with Zen. Well, Zen masters can teach us more about user retention than conventional marketers. Don’t believe us? 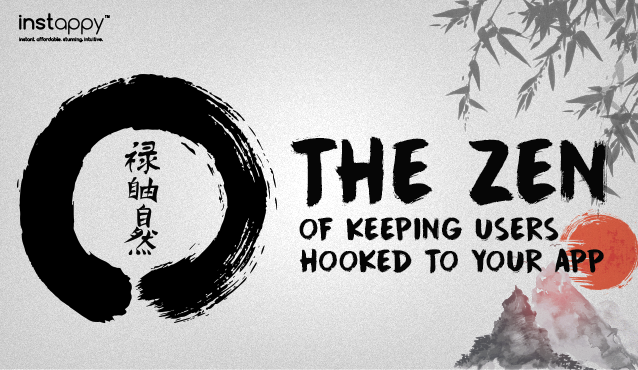 Here is some paradoxical wisdom from Zen on keeping users hooked to your mobile app. Zen abhors hard work. It embraces effortlessness, instructing followers to step out of the way and letting things happen. How does this apply to improving your app user experience? Well, it means, as a business, you should make your app intuitive enough for users to figure out its working on their own, especially the first time they tap on your app. If your app is one of those which needs the user to sign up, you should let them create an account in as few clicks as possible. Better yet, give them the option to sign up using their e-mail, Facebook or Google account. Think of a signup so frictionless that users start using the app before they even know it. If your app is relatively intricate, design help screens to make them understand the key features and interface. We all know it. Done right, push messages can do great things. What most businesses fail at is getting users to opt in for receiving push notifications. Ironically, one of the reasons why users don’t opt-in is because they don’t get the choice of opting out of push notifications. Ideally, you should give users the freedom to opt in or out of push notifications anytime they want. Better yet, let them decide what messages they want to receive on which channels and how frequently. Further, keep an eye on key app metrics to get an idea, how your users are responding to your messages. You know it how walking in an ill-fitted shoe can wear you out. It constantly reminds you of its uninviting presence. But when it fits, it’s the last thing you’ll ever pay attention to. It works pretty much the same for app user interface. Users pay attention to the user interface only when it is poorly designed. A well-designed interface is invisible and gets the user right away to the content. As they say, good design is obvious but great design is transparent. The bottomline – Lay too much emphasis on form and just not enough on function, and you can be dead sure your app will never take off. So better be minimalistic in your approach. Screen saturation is a thing of the past. Today, designers need to ‘just get out of the way’ and focus on delivering what the audience really care about – The content. Find your app analytics ‘aha’ moments. Today, businesses are surrounded by data but not enough information. According to Kissmetrics, 95% of data within organisations remains untapped. Even those who deploy data fail to derive actionable insights from it. But a marketing strategy that’s not driven by analytics is a leaky bucket. Keep putting more water into the bucket and it won’t help. Getting the holes fixed will. And that’s what app analytics does. It tells you, what makes the users click, how do they navigate through the app, which screen turns them off, and so forth. Instappy comes geared with smart analytical tools that help businesses understand their audience better, shape smarter marketing strategies, take better decisions and improve the bottomline. Unless you happen to be Chuck Norris, your first app can’t be perfect, and it never will be if you are not open to user feedback. Even if your app is inches away from success, you can’t afford to get complacent or turn a blind eye to further improvement. Keeping a tab on customer feedback is essential for growing your app; whether it’s a bug bugging your app, a flaw in the navigation or long loading time. In-app feedback form lets your users report bugs and give suggestions directly without ever having to leave your app. In-app feedback is proven to reduce negative reviews on the app store by a substantial fraction. Instappy powered apps come loaded with an integrated in-app feedback form to help you listen closely to your customers. What is Zen? If you don’t ask me, I know what it is. If you ask me, I don’t know. Sounds paradoxical. Right? Well, that’s how Zen is – Paradoxical. From time immemorial, Zen masters employ paradoxes as a means to achieving Satori, sudden enlightenment. We hope you employ these 5 Zen paradoxes to improve user retention and boost engagement on your app.